You've got a Boss and a Killer - what more do you need? 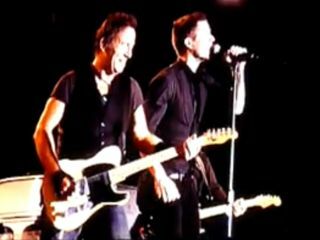 This weekend, Bruce Springsteen was joined by The Killers' Brandon Flowers for a, er, thunderous take on his 1975 classic Thunder Road at the Pinkpop Festival. Both Bruce Springsteen And The E Street Band (with Max Weinberg's 19-year son Jay beating the drums) and The Killers played the opening night of the three-day Netherland's music fest. At first, the idea of Flowers, an obsessed new wave enthusiast, sharing the stage with Springsteen, especially on a sprawling, grandiose epic such as Thunder Road, might have some scratching their heads. But ahhh, go back and have a listen to The Killers' unfairly dismissed sophomore effort, 2006's Sam's Town. There's more than a little Born To Run/Darkness On The Edge Of Town influence to be found. This has obviously not been lost on Springsteen, who has become a fan of the Las Vegas-based band. And as for Flowers, well, take a look at his face as he stands this-close to The Boss at the mic - the guy's having the time of his life.